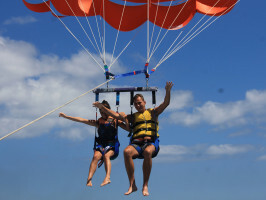 Make it a holiday to remember and take part in a parascending experience that will leave you wanting more! - Fly at 50m or 400 – you choose! 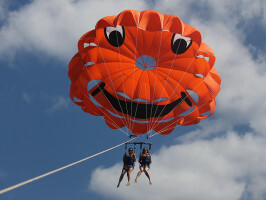 Come and fly high in the sky for the ultimate birds eye view over Puerto del Carmen or Playa Blanca. 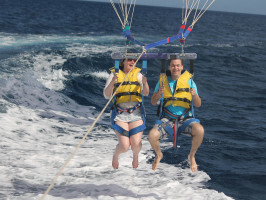 Whether you’re new to it or it’s your first time, parascending is exciting, thrilling and will sure be the highlight of any holiday. 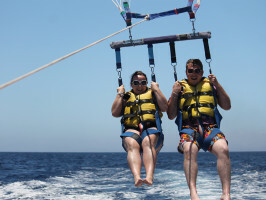 From the moment you’re propelled high into the sky to when you’re soaring above the ocean, you’ll feel the thrill of floating mid-air with some of the best views over the beaches – if you dare to open your eyes! You’ll feel the fresh sea breeze and be in safe hands with an experienced team here to help and guide you. Choose whether you fly at 50m or if you’re feeling brave take it to 400m; either way it will be an experience you won’t forget. Children under 8 years are not allowed. This activity is not recommended for pregnant women, people with heart problems and other sensitive illnesses. Start time/session Parascending: 12am, 2pm and 4pm. Participants must be aged 8 years or older. Children aged under 18 years must be accompanied by an adult, age limited to 8 years.